What age is the correct age to start having homework? Is it too early to start in Kindergarten? In my opinion, yes it is. I think children shouldn’t have homework until 3rd grade. That is not so say that they shouldn’t be practicing skills at home like reading or computer skills. 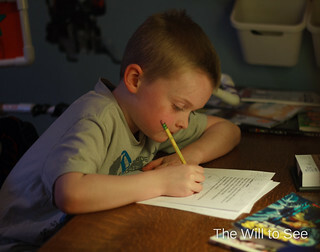 When Jack was in Kindergarten, he had homework sheets almost every night, plus sight word lists and reading to complete. Some nights we would spend over an hour working through everything, not including our reading time before bed. That is just too much for a 2nd or 3rd grader, let alone a Kindergartner. Jack actually had less homework in 1st grade than he did in Kindergarten. I think there shouldn’t be homework until 2nd or 3rd grade, except for reading logs. It is important for early readers to practice their skills daily and this will help with sight word practice as well. It is important for kids to come home and relax, give their little minds a break and be kids. Creative, imaginative play can be just as beneficial for their development as worksheets and busy work. Recently I was talking with a friend who has a Kindergartner this year and she mentioned that there is a new policy of no homework for Kindergartners. This is great. I have also heard of some school districts not having any homework for elementary schools. This may seem radical to some people, but isn’t it worth thinking about? This of course is simply one of many societal examples in which kids are pressured to grow up as fast as possible (select sports at age 6?). Our children are going to spend years in school with mountains of work in high school and college. Shouldn’t they be allowed to enjoy their childhood? What’s the rush?